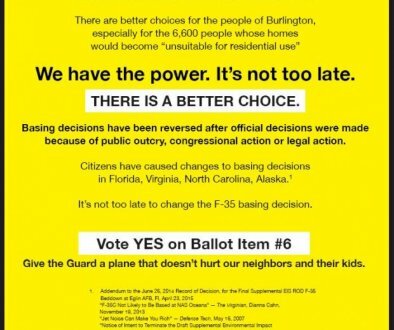 The Burlington City Council on Monday agreed to allow voters to weigh in on the future basing of the F-35 fighter jets — but not before a lengthy discussion about ballot wording that, in the end, will remain the same. The Town Meeting Day ballot question is advisory, and is not likely to prevent the planned 2019 arrival of the F-35s. The crux of the debate during Monday’s meeting centered not around the vote itself, but around language F-35 opponents used conveying “strong support” for the Vermont Air National Guard. Col. Hank Harder, the guard’s 158th Fighter Wing Vice Wing Commander, agreed with the proposed amendment, saying Monday that it would be “disingenuous and misleading” for F-35 opponents to frame their question in terms of support for the guard.